Russian aluminium giant, Rusal has held a secret briefing at London’s Skinners’ Hall for its London IPO investors . Rossini came from humble origins; his father was a slaughterhouse inspector, his mother a baker’s daughter. He had made himself wealthy enough, and his career assured, by the age of 32; he stopped writing music for money five years later. But the problem of cash for the self-made rich is that they never feel secure without more of it coming in. The problem of Oleg Deripaska and Victor Vekselberg — the two Russians who made themselves very rich in a short time by mining and smelting some of the world’s largest volumes of bauxite and aluminium — is that, like Rossini, they believe the only cure for nerves is cash. But unlike Rossini, they haven’t the public reputation to stand on a pedestal. Since an Initial Public Offering (IPO) is the London market’s equivalent of a statue on a pedestal, and the investor cash at stake runs into several billion dollars, the reputational risk of the pedestal is now the subject of extraordinary measures. Last Friday, in London, at Trinity House, managers and bankers of United Company Rusal arranged a highly secret, and carefully screened briefing. All trace of the session was carefully wiped, except for two umbrellas left behind with the Trinity House porter. Rusal is the recently merged form of Deripaska’s and Vekselberg’s aluminium assets; Deripaska owns 66% of the new company; Vekselberg 22%; and Glencore, which has contributed alumina refineries, 12%. Registered in the British tax haven of Jersey, the Rusal IPO calls attention to itself as the largest proposed for the London Stock Exchange for this year. A market capitalization target of $30 billion has been set, with a share sale of up to 25%. It is also, according to sources who were at Trinity House, the subject of a series of problems Rusal managers and tune-whistling public relations men have yet to address convincingly. These include litigation pending against Deripaska in the UK, and Vekselberg in the US, for attempting to sell assets to which others lay claim, alleging breach of trust; charges of corrupt practices in violation of the US statute on the part of the original Rusal, its owner and managers, also pending in the US and UK courts; charges against Deripaska that have already led the US Government to revoke his entry visa; deposition orders that have made Vekselberg reluctant to cross the US frontier (he has already repudiated his US immigration green card); a ruling from last year by a UK High Court judge that condemns Rusal business practices in Tajikistan; and investigations by government officials in several jurisdictions that have been triggered by the IPO proposal, and the US government action against Deripaska. And if these weren’t problems enough to whistle at, there is the possibility — reported before in Mineweb — that once the IPO sets a market value for Rusal, Kremlin officials have in mind to take control of domestic aluminium-making; a process many behind that particular wall regard as the most profitable form of converting Russia’s state-owned electricity into cash. That President Vladimir Putin all but called Vekselberg an asset thief in recent remarks about how the huge Siberian gasfield Kovykta fell into his, and other Russian shareholder hands, a decade ago, sharpened the concern felt at Trinity House at the way aluminium smelters fell into his and Deripaska’s hands; and might slip out again. Vera Kurochkina, Rusal spokesman, was asked to confirm that Rusal had arranged Friday’s session with brokerage analysts. She refused. A source inside JP Morgan, one of the US banking groups selected to sell Rusal shares at the listing, claims there was an attempt at blacking out the US side of the investment bank by the Cazenove side; the latter believes it is more secure from the legal liabilities that arise from the litigation over assets Rusal is attempting to sell to shareholders. Kurochkina declined to say who spoke for Cazenove-JP Morgan, or Morgan Stanley. Morgan Stanley is already jumpy. Two years ago, in the preparation for the London IPO of Russian steelmaker Evraz, the research department of the US bank clashed with the investment banking side, claiming the latter were ignoring contested claims to ownership of substantial shareholdings in Evraz, which were being put up for sale by principal shareholder, Alexander Abramov, as if they were his. Mineweb reported the details of the claims at the time; Abramov paid them off in confidential out-of-court settlements. Morgan Stanley, according to a banker engaged in the share trading at the time, quietly dropped out of the Evraz IPO altogether. According to a London Times report, Goldman Sachs is reportedly another of the US banks that is contemplating an underwriting and book-running role for Rusal in the share sale. There, too, there are internal conflicts over whether the Rusal asset risk is too great to justify the claims the drafters of the Rusal prospectus will make on behalf of the prime sellers, Deripaska and Vekselberg. Inside Rusal’s own legal team, there are also recriminations. It was publicly reported ten days ago, and independently confirmed by Mineweb, that Max Goldman, the coordinating lawyer at Rusal for the IPO, has left his post. The Lawyer.com, a London lawyers’ website, reports that Goldman was “set to coordinate the much-anticipated flotation in London, which has gifted [sic] roles to Ashurst, Cleary Gottleib Steen & Hamilton, Egorov Puyginsky Afansiev & Partners, and Linklaters.” A source close to Vekselberg told Mineweb that a number of the lawyers involved in preparing the merger of Rusal with SUAL, since it was announced in October of last year, were promised substantial rewards. These were to be paid by both Deripaska and Vekselberg, the source said, adding there is considerable disgruntlement, because they haven’t been paid. Among the non-payments, the biggest in value was the subject of an agreement between Vekselberg and former SUAL chief executive, Brian Gilbertson. When SUAL went out of existence in March, and Gilbertson was dropped as chairman of the new Rusal, Vekselberg and Gilbertson failed to agree on compensation. Gilbertson believes Vekselberg defaulted; the threat of litigation hangs over the negotiations which continue between representatives for the two men. Gilbertson, now engaged in a new takeover for Consolidated Minerals in Australia through his Pallinghurst Resources, could reenter the Rusal IPO stakes, if he were to provide litigants with evidence that investors may be unable to find in the Rusal prospectus. Legal specialists fault Langley for going further than the available evidence and case law allowed. It is said that, even if Langley’s ruling is accepted that Deripaska is not domiciled in his UK homes for the purposes of Cherney’s lawsuit, his agreement – signed on March 21, 2001, in a well-known London hotel, with physical witnesses and corroborating documents — establish the jurisdiction of the High Court over enforcement of Cherney’s claim. In addition, experts preparing the appeal of Langley’s ruling say, Deripaska was adequately served with the Cherney writ for the case to commence. 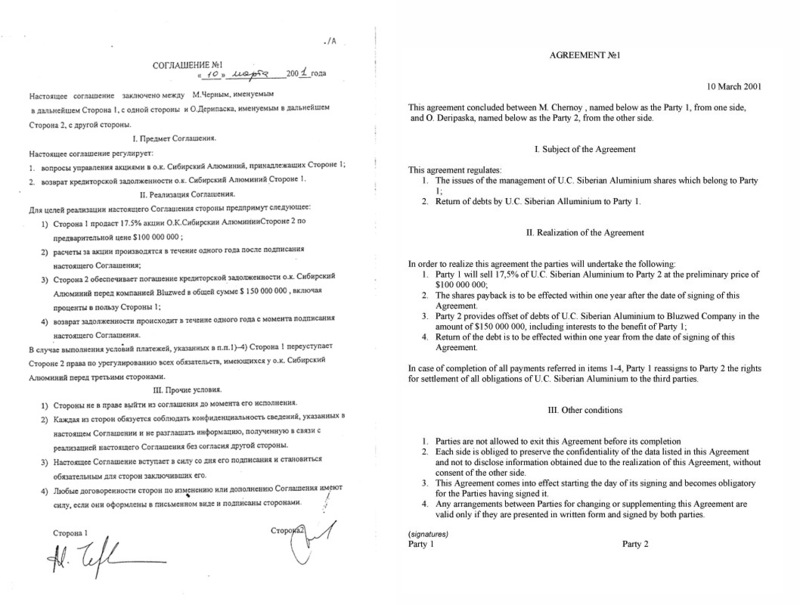 The Russian agreements that are the foundation of this case, plus an unofficial English translation, can be read at: link 1, link 2. What the banks proposing to underwrite Deripaska’s sale of his shares cannot do is to ignore where it was signed, and what the agreement says — that Cherney, whom everyone close to Deripaska admits put him in the aluminium business, continues to own a 20% stake in Rusal’s shareholding, for which Deripaska hasn’t paid; and which, accordingly, Deripaska lacks the legal right to sell. One source, close to Deripaska for many years, admits that he himself remains personally fond of Cherney; hasn’t felt obliged by his duty to Deripaska to cut his links with Cherney; and telephones him from time to time to ask Cherney’s advice. A prospectus that says otherwise about the Deripaska-Cherney relationship is likely to expose its drafters to fraud claims. No Russian asset that has successfully passed through the IPO disclosure requirements of the London Stock Exchange has an asset liability obstacle as tall as this one. Those IPO’s which have had such problems, albeit on a smaller scale, have either withdrawn before listing to mend the liability, or compensated shareholder claimants with provable trustee agreements. 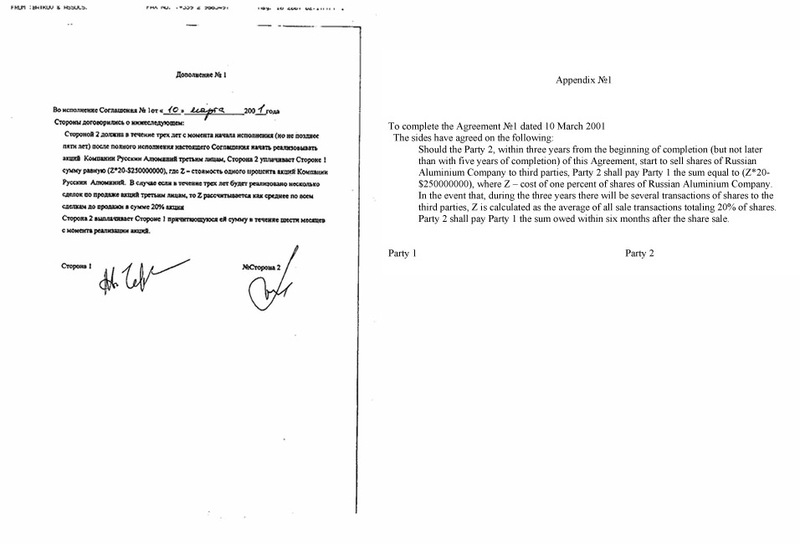 Those agreements, which the evidence confirms were signed in London, have always been paid. It is this standard of disclosure, and its obvious Black downside, that has started speculation, circulating widely in the City of London, that the full listing which Rusal wants requires too much disclosure. This, runs the assessment, exposes the bankers, lawyers, and Deripaska himself to too much liability for incomplete disclosure. The recommended fall-back option is listing Rusal as a global depositary receipt (GDR). The problem with this as a less demanding procedure of disclosure to investors is that the asset cat is already out of the bag. Continuing to think zoologically, what investor will buy such a pig, if the poke of second choice is admitted to have loopholes that make the first poke untenable? If Rusal believes its valuation is $30 billion, Cherney’s stake is arguably worth $3.96 billion. And if Rusal wants to sell 25% of the shareholding, then Cherney’s share of the proceeds from Deripaska ought to be $990 billion. That’s a big sum. But it’s not one Deripaska – who has paid all major asset claimants who have sued him, whether they secured US or UK court jurisdiction, or not – cannot afford to borrow; even if he is already obligated to share his proceeds with the Kremlin, by way of compensating for a decade of tax minimization, and delaying a state takeover. The more insiders like Goldman and Gilbertson leave Rusal disgruntled, the more evidence that could be sought from them to indicate what, until now, the insiders have been reluctant to concede that they have even discussed – what is Deripaska’s ongoing relationship with Cherney, and why doesn’t he pay him off? This question has become especially sharp for US citizens working for Deripaska, since it was revealed that sometime between July and October of last year, the US Government decided that Deripaska’s undertakings to it lack the veracity to warrant his retaining his entry visa. US citizens with potentially culpable knowledge of Deripaska’s business practices in Tajikistan, Nigeria, and Guinea, for example, include Peter Clateman, Rusal’s general counsel, and the new coordinator of the legal side of the IPO. Under the US Foreign Corrupt Practices Act, Clateman is liable to answer the allegations lodged in ongoing or decided court cases filed in the US and UK, regarding payments to foreign officials. US bankers and banks, through which Rusal’s cash to and from Tajikistan and Nigeria, has flowed, appreciate they may be in a similar position. It is noteworthy that the banks reported to be in line for Rusal’s IPO mandate – JP Morgan, Morgan Stanley, Goldman Sachs, Credit Suisse, UBS, and Deutsche Bank – don’t include a bank from the large syndicates which have loaned money to Rusal over the past six years, since its formation. In June, Rusal announced a $2 billion secured fund-raising by ABN AMRO, Barclays Capital, BNP Paribas, Calyon, Citi, ING, Natexis and Societe Generale. Why is there no overlap? Why aren’t the banks which know Rusal best also participating in the IPO? One reason is that the banks which have been lending cash to Rusal longest also have in place the most elaborate methods to secure repayment of aluminium loans, in the event of default. Thus, they know how Rusal’s aluminium trading schemes work; why the metal changes title as it crosses the Russian frontier; and how title, metal and money move between intermediary traders, final users, and Rusal’s profit centres. Knowing the confidential secrets of Rusal’s trading schemes – also the subject of a successful lawsuit against Rusal by the Reuben brothers of London – creates for the lending banks a knowledge of transaction risk, cashflow and taxation risk, which these banks have sworn to keep secret. They would be in a more exposed position towards unsecured share- buyers, a position they may not want. Whistling tunes to the financial press and the share markets is costly, especially if the refrain is unmelodious. Financial Dynamics, Rusal’s London PR agent, is currently in dispute with another Russian client over early termination of agreement for GBP60,000 worth of song-writing per month. So far, by keeping Rusal’s roadshows in London, Frankfurt, and Edinburgh as secret as possible, Rusal seems to be more afraid of whistle-blowers than confident of the tune it wants investors to hear. Where is Rossini now that Rusal needs him? One of the most successful tunes he wrote is the overture to an opera about a girl about to be put to death for a theft she was falsely accused of, and didn’t commit. She is rescued at the last minute by la gazza ladra. The tune is more famously known by its English title — The Thieving Magpie.